Installing a custom ceramic tile shower adds beauty and charm to a bathroom. Tiling a custom ceramic tile shower does not need to be left to the pros. With a little upfront knowledge and the right tools you can tile your own custom shower. 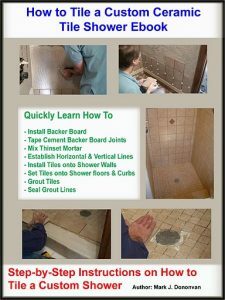 Before jumping into a custom ceramic tile shower project its important for you to first understand the key methods and techniques on how to tile like the pros and prevent the risk of a leaky ceramic tiled shower floor. Learn the Secrets to achieving a Professionally Ceramic Tiled Shower without the Exorbitant Costs! 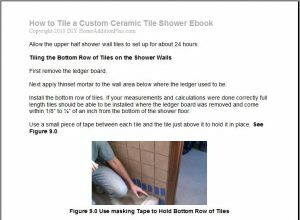 Our 16 page “How to Tile a Custom Ceramic Tiled Shower” Ebook provides step by step instructions on how to tile a shower stall properly. In less than 60 minutes you will fully understand what you need to do to properly ceramic tile a shower stall. 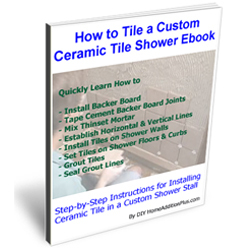 Order Now and Immediately Download the How to Tile a Custom Ceramic Tile Shower EBook today! 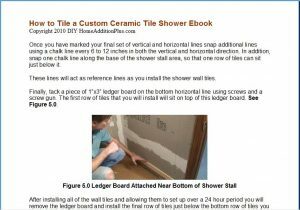 The How to Tile a Custom Ceramic Tile Shower EBook costs only $15 and is 100% guaranteed. Don’t Waste a Fortune on Scrap Tile Pieces! Learn How to Install Tile the Right Way!! About the Author: Mark Donovan is a contributing writer to the Weirs Times, a state wide newspaper in New Hampshire. His column “Home Improvement 101” can be found weekly in this newspaper. He has also written hundreds of articles on home improvement projects, and his Vacation Home Project was featured on the DIY Network’s Be Your Own Contractor Vacation Home Series in 2005. Over the past 25+ years Mark Donovan has been involved with building homes and home additions. His projects have included: building a vacation home, building additions and garages on to existing homes, and finishing unfinished homes.